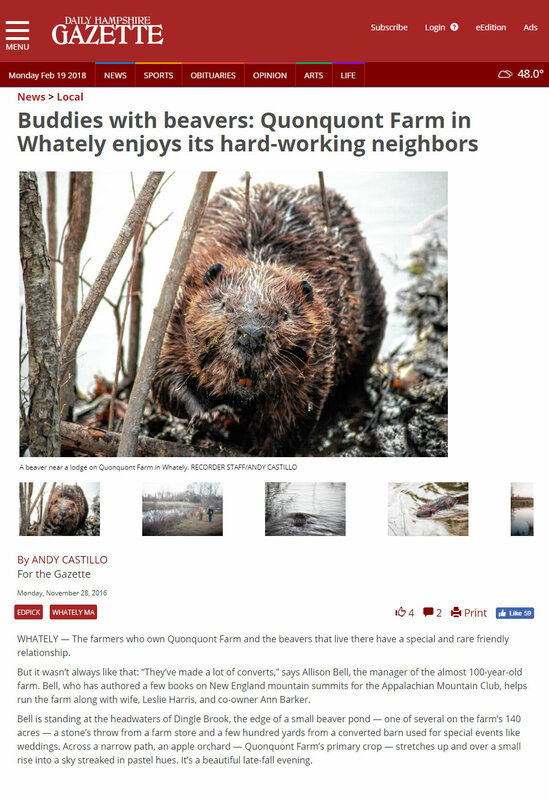 WHATELY — The farmers who own Quonquont Farm and the beavers that live there have a special and rare friendly relationship. But it wasn’t always like that: “They’ve made a lot of converts,” says Allison Bell, the manager of the almost 100-year-old farm. Bell, who has authored a few books on New England mountain summits for the Appalachian Mountain Club, helps run the farm along with wife, Leslie Harris, and co-owner Ann Barker. Bell is standing at the headwaters of Dingle Brook, the edge of a small beaver pond — one of several on the farm’s 140 acres — a stone’s throw from a farm store and a few hundred yards from a converted barn used for special events like weddings. Across a narrow path, an apple orchard — Quonquont Farm’s primary crop — stretches up and over a small rise into a sky streaked in pastel hues. It’s a beautiful late-fall evening.